Where has time gone? It is Tuesday and time to focus on tea and tales as one is want to do while sharing tea with friends. I am still coming down from the high of preparing an Edwardian menu for Master J’s birthday on Sunday. I was able to accomplish this without jello molds or puddings, so it can be done. Still a bit tired, but also a bit sad, feeling sentimental about how precious time with family is, how quickly children grow up. Downton Abbey Casting News: there is more below stairs casting news for Season 3. Another footman, named Jimmy, will be played by Ed Speleers of Aragon fame. 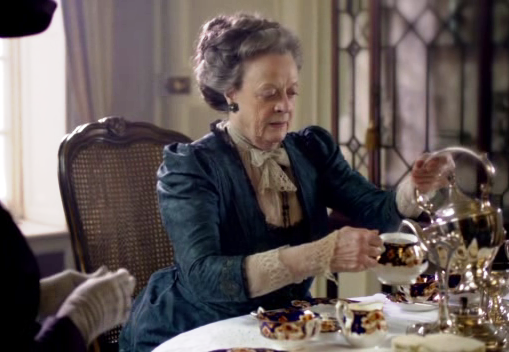 Downton Arby’s: A fun new parody is making the rounds online. Videos: If you would rather watch than read, I have added some great TV shows about the Edwardian era on my You Tube Channel. I discovered much of this content on Evangeline Holland’s channel, who blogs at Edwardian Promenade. She is an author of Edwardian fiction and knowledgeable about everything from that period. Titanic Mini-Series Reviews are in: Canadians were given the first opportunity to view the first installment of Julian Fellowes’ Titanic Mini-series last week. I gave me indigestion to the point that I had to get up at 4:30 in the morning to write a review. It was aired in the UK on the week and British reviewers were equally unimpressed. “Despite these harsh words however, nearly seven million tuned into catch the show, and with the Telegraph’s Crompton promising ‘having seen part two, I can assure you it gets better,’ it may be able to negotiate its way through tricky waters yet.” I will follow the entire series out of duty, but really not looking forward to it. Lady Ellen’s Excellent English Adventure: The power of the written word or tweet is not to be denied. Stay tuned for the extraordinary story of an American who read a tweet I shared about an event the luxury UK hotel Tylney Hall was hosting: luncheon with Lady Carnarvon. Not only did Ellen travel to Hook to attend the lunch, but was personally introduced to her Ladyship by the hotel organizers and treated like royalty. As Lady Mary would say, “I hope you don’t pay attention to anything I say. I never do”. I am actually glad Ellen didn’t. It was a trip of a lifetime. 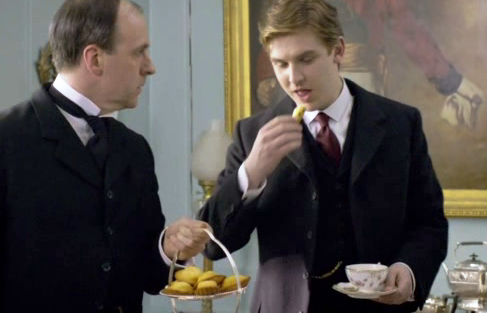 I had been meaning to pay some attention to madeleines after the post we did a few weeks ago about tea etiquette, using Matthew’s manners as an example as a tea don’t. Yesterday, we acknowledged the great French chef Auguste Escoffier for his influence on Edwardian cuisine. The British may do Afternoon Tea well, but have had help from their neighbors across the pond in bringing the very best cuisine to their tables. It is not surprising, then that French influences creep onto the tea tray. 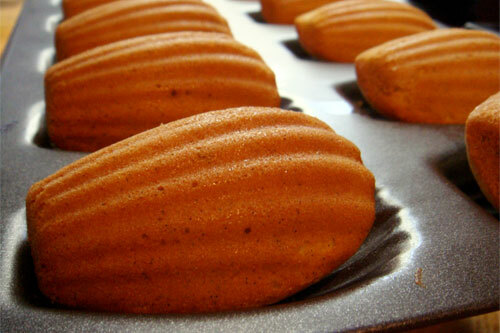 Madeleines (Pronounced: mahd lehn) are little cakelike cookies that are baked in special molds that give them a delicate shell shape. They date back to 1755 in the the court of Louis XV, reportedly prepared in honor his father in-law’s cook Madeleine Paulmier. They are more famously linked to author Marcel Proust, who described them as “…little shell of cake, so generously sensual beneath the piety of its stern pleating.” He gave them quite a build up in his writing which sparked the imagination of gastronomes (foodies). I do try to provide you with easy recipes which don’t require special equipment. You can make these without the special madeleine pans, spooning directly onto cookie sheets, but you really couldn’t call them madeleines. Or you can skip the whole baking process and just pick up a small package at Starbucks and happily dunk the cookies into your coffee of choice. But today you will learn how to make them yourselves and today’s treat is dedicated to Lady Ellen who enjoyed warm madeleines in London just last week on her whirlwind adventure. In a small saucepan over medium heat, melt the butter. Set Aside. In a large bowl, beat the eggs and sugar with an electric mixer on medium speed until light and fluffy. Stir in the flour, almonds (if using), baking powder, and salt and beat for an additional 3 to 5 minutes, or until well blended. Stir in the honey, melted butter, and lemon and orange zests. If you are making chocolate version, omit the zests, stir in the cocoa powder and melted chocolate. Cover the batter with a piece of plastic wrap and refrigerate for 3 to 4 hours or up to 1 day. Preheat the oven to 325°F/160°C, Gas Mark 3. Spray two 12-well madeleine pans with cooking oil. Dust with flour. Spoon 1 rounded tablespoon of the batter into each well. I have a handy little ice cream scoop which does the job quick nicely. They will be 2/3rds full. Bake the two trays in the upper and lower thirds of the oven, switching the positions of the pans halfway through baking, for 20 to 25 minutes total, or until golden around the edges. Remove from the oven and let cool for 5 minutes on a wire rack. Invert the pans to remove the cookies and dust with confectioners’ sugar. In a small saucepan over medium heat, melt the butter. Add the loose tea or tea bags to the melted butter and let sit for about 5 minutes. Press on the tea bags to extract maximum flavour. Discard the tea bags and set aside. In a large bowl, beat the eggs and sugar with an electric mixer on medium speed until light and fluffy. Stir in the flour, baking powder, and salt. Stir the butter/tea mixture into the batter. Stir in the honey. Cover with piece of plastic wrap and refrigerate the batter for 3 to 4 hours or up to one day. Preheat the oven to 400°F/200°C, Gas Mark 6. Spray two 12-well madeleine pans with cooking oil. Dust with flour. Bake the two trays in the upper and lower thirds of the oven, switching the positions of the pans halfway through baking, for 10 to 12 minutes total, or until golden around the edges. Video: If you are more of a visual learner and would like a few extra tips or alternative ways to prepare, you may enjoy this YouTube video. 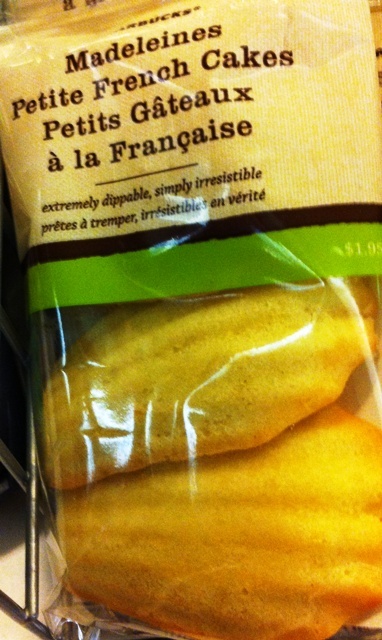 I love madeleines, such a nice light little cake. I usually make a batch and freeze them as we generally won’t polish them off in one or two sittings. They make a nice, quick dessert, either with a chocolate sauce or just a little jam with some crème fraiche.